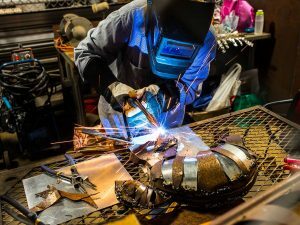 This class is for students who have previously taken a metal sculpture class or have welding experience and wish to continue to advance their metalworking skills. You will be guided through any design or technical challenges while you work on individual projects. Bring your ideas and be ready to create. Please wear heavy pants and boots. Bring safety glasses/goggles and dust masks.